The editors of Medulla Review just released their latest issue of poetry, stories and art inspired by the Major Arcana. The artwork is by the editor, Jennifer Hollie Bowles, who gives a statement about the process of creating this ambitious journal in an open letter, found here. She explains in her letter that although she is not a trained artist, she did not receive enough art to have an image for each of the cards, and therefore she decided to produce images herself that would reach into the psychic places the tarot is known to trigger. Here’s a direct link to my poem, “High Priestess.” I wrote this poem for the prompt during a week when a few of my poetry buddies and I were completing an 8-day poetry writing challenge. Once our writing spree came to an end, I revised “High Priestess” and sent it off. If not for the 8-day challenge, I doubt I would have had the discipline to write to the Tarot prompt in time for the submissions deadline, so I’m grateful my friends inspired me to write. 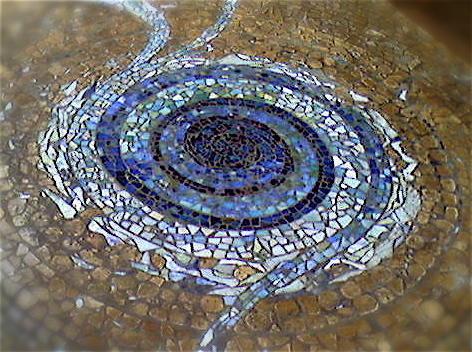 Mosaic at The Crossings in Austin, Texas. I took this photo while at a writing retreat there with Amherst Writers and Artists.